Below, you will find some useful website links and telephone numbers for travel-related services. For up-to-date details and information on seasonal variations, please contact the providers directly. 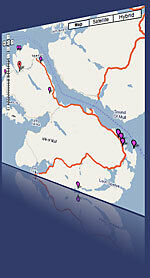 Scroll down the page, or click here for our Interactive Map of Mull – great route planning for drivers, walkers and cyclists using the roads. Mull is served by three ferries with Craignure being the main terminal. On Mull there are several bus services in operation, Nos. 494; 495 and 496. On the interactive map below, you can use your mouse or trackpad to click and drag to scroll the map in any direction and to zoom in or out. Type in your address to get directions. "a pleasure to stay in"
"a joy to come home to"
"don't want to go home"
These are just a few extracts from the many comments we receive from delighted guests.